What we fail to see. Churches of Santiago: a place to know our heritage. This project originated some years ago, as a result of a reflection that came to mind from an every day event. As I was walking down the streets of Ñuñoa, among some new buildings, I observed a church, a neighborhood chapel, like so many others existing in the district, in Santiago, and in our country. Then, I thought of so many things that are lost in our everyday lives and that people living in the capital do not see or do not know how to observe, and that these have a lot to tell. I remembered that “neighborhood chapel,” I used to go to, the church of the Sacramentinos (Basilica del Sagrado Corazón) and I asked myself, how many people know the historical and cultural value of this church? How many people know that its design was inspired in the Basilica of the Sacred Heart of Paris? How many people know their origin and their history? How many people know their name and their laudable aesthetic value? They remain forgotten, although they are still a milestone of this centric zone. Thus, the idea comes to mind of creating a catalogue with some churches in Santiago, those declared National Monuments, and the most emblematic, because of both their aesthetic value, as well as their contribution socially, culturally and in terms of our patrimony. 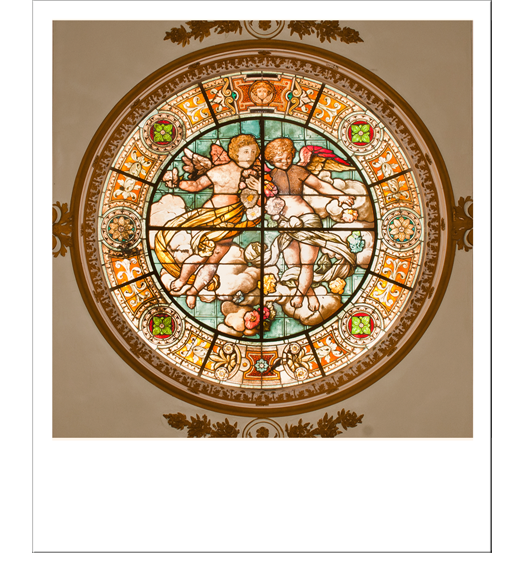 In this respect, this cultural promotional catalogue, seeks to have the observer recognize from their architecture, the design and religious art of the intrinsic cultural patrimony of Santiago’s churches. The idea is to educate our observation, so that one can know what to observe and why. Priests: Monseñor Juan de la Cruz, Monseñor Bernardo Herrera, Jesús Bonacchia, Juan de Dios, Riogoberto Iturriaga, Darío Silva, Francisco Quijano, José Huneuus, Alejandro Abarca, Fernando Vega, Patricio Yedo, Luis Roblero and Luis Quintanilla. Sister Gesualda of the Iglesia de Til Til. Sacristans of San Francisco, Recoleta Franciscana, Basilica Corazón de María, Capilla del Hospital del Salvador, Iglesia Santa Ana and San Lázaro. Sebastián Lira, Jaime Huerta, Carlos Olivares, Fanny Villa, Ricardo Sánchez, Rodrigo Benavente, Andrew Scott, Miss Otilia, Guillermo Carrasco and Leonardo Mellado.